A Casket Spray is your tribute from the heart, in rememberance of a special life that's been lost. Commemorate your loved one with freshly arranged flowers in their favourite colours, creating a beautiful floral memorial in their honour. Please relax and take your time to think. What would make the perfect casket spray for your loved one? What was their favourite colour? Did they have a special flower? Is their personal style pretty vintage, or bold & striking, rustic or simply elegant? Can I choose another Colour for my Casket Spray? Yes of course. We can make casket spray funeral arrangements in any colour and will custom make for you - the below pictures are some of the many sprays we have made and are some of our most popular designs. We wanted to put a range of casket spray flowers online, allowing you quiet time to view and arrange the floral aspects of the funeral quietly and privately at home, giving you time to think. Coming direct to the florists to choose the perfect spray to go on the coffin, you are going to be talking directly with the florist who is going to make it for you. Tell us the flowers they loved, their favourite colours - the football team they lived for, or the gardens they enjoyed - we consider it the highest honour to play a small part in your funeral arrangements. Can you include Personal Touches in the Flowers to go on the Coffin? Yes your flowers will be a bespoke design and we can add personal special touches for you including sports gear, memorabilia, flowers, fruit - or even vegetables - from their own garden and any other special things, to make the casket arrangement completely unique and personal to them in this final gift of love. We will gently and respectfully organise with you all the floral details to create the perfect tribute - and arrange for early delivery to the funeral home, chapel or location of the funeral for you, to get there when you need it. Please call our florists direct on 09 838 9058 to discuss how we can help during this difficult time. 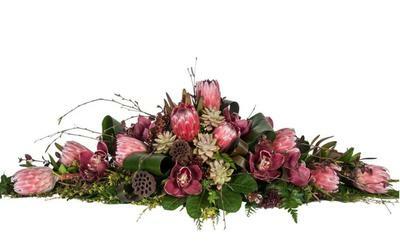 Best Blooms Award-Winning Florist - Auckland N.Z. 's leading florist.